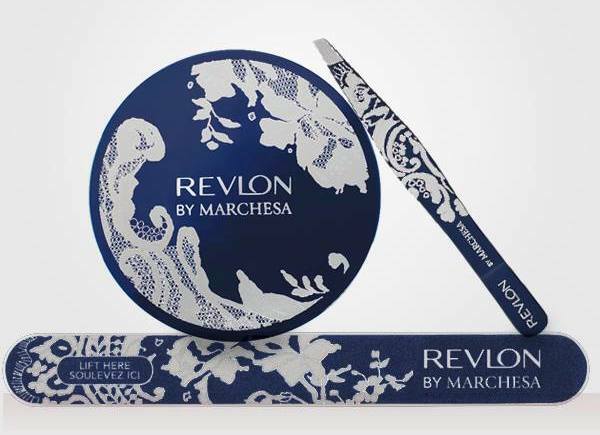 Marchesa and Revlon have teamed up once again, this time for a collection of glamourous beauty tools in 3 runway inspired designs and colours to add sophistication and glamour to your beauty routine.. Box O' Files - $4.49 - a mini matchbox box of 6 small files perfect for travel. Mini Tweezer To Go Set - $10.99 - with slant and point tip tweezers in a travel pouch. Manicure Essentials Kit - $12.99 - contains a nail clip, cuticle trimmer, buffer and compact emery filer with pouch. Starter Brush Kit - $15.99 - contains 3 essential brushes: powder, shadow and double usage concealer/lip brushes - crafted using ultra soft, premium fibers and natural birch wood handles - in a convenient pouch.